A new, revolutionary patented lifting system incorporates locking jack stands loaded into a hydraulic mobile power unit—providing a one-step lift and secure operation. 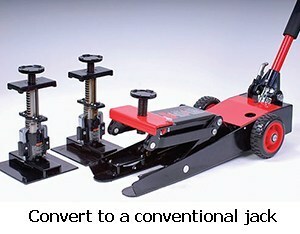 The SafeTJack™ has made lifting and mechanically supporting faster, easier and simpler than ever before. The hydraulic system’s speed coupled with the quick-loading mechanical stands significantly increases productivity at a fraction of the cost of conventional lifts and hoists. Virtually every jack that is produced anywhere in the world has a warning notice that says, “This is a lifting device only, the load must be transferred to a mechanical stand for safety.” There are usually only four (4) lift points designated by today’s car makers. Since the point where the jack lifts is also the point where a mechanical stand needs to be, there is no place to put the stand. Safely and easily transferring the load has been impossible. The result is a mechanical stand positioned at the recommended manufacturer’s lifting point without having to get under the car to position a mechanical stand at a less optimal lift point. Safety – The user never gets under the vehicle to place a stand, reducing accidents and deaths. Optimal Performance – The stand is placed at the optimum manufacturers recommended lift point. Cost Effective – Completely eliminates the need to transfer weight and reduces the need for multiple jacks, making it 9X faster. 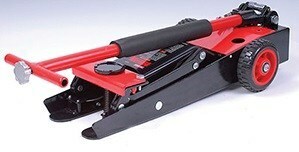 Power unit automatically converts to a conventional floor jack. Handle folds down for easy storage. 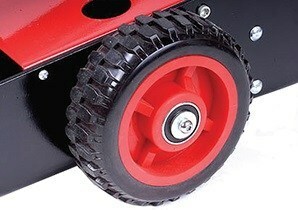 Professional Grade Quality; durable and able to handle any job. The owner of the SafeTJack™ seeks a strategic partner to launch the product domestically and worldwide. The strategic partner would be able to manufacture, distribute, market and finance the venture. Our projections estimate the product could generate hundreds of millions in revenue per year and tens of millions in profit to the right company. Contact owner for more information. U.S. Patents 7,413,168; 7,410,148; 6,986,503;6,779,780; 6,648,299 and other related US and foreign patents and applications.